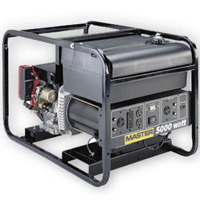 Rugged and compact generator provide steady power while standing up to heavy use on a 1″ steel welded frame. Powerful, brushless alternator design provides excellent motor starting capabilities and long life. Clean waveform for use with electronic equipment. Feature hour meter, circuit breaker protection, low-oil shutdown protection, and decompression control for easy starting. They also have rubber vibration dampeners on engine and alternator. Engine features include cast iron cylinder sleeves, dual element air cleaner, and ball bearings on the crankshaft. 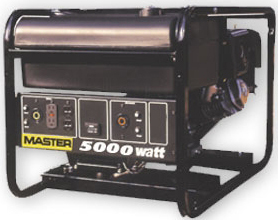 The MGH5000CIE Watt Generator is built in Auto Idle on Premier Series. It automatically reduces engine speed when no power is being used, which reduces fuel consumption and noise. Ratings apply to SAE standard conditions. Reduce ratings 3.5% for each 1000 feet above sea level and 1% for each 10 degree Fahrenheit rise above 60 degree F.
Super Quiet Muffler System with spark arrestor for use in the U.S. National Forests. For heavy construction site work; such as running large electrical power tools, or supporting temporary power needs for construction, commercial, and industrial applications.